To mark the international Africa Day on May 25th, information artist Ivan Colic, based in South Africa, has published a impressive map of Africa on Afrographiqe. Africa Day is a public holiday in various african states that celebrates the founding of the Organization of African Unity (OAU / Organisation de l’Unité Africaine, OUA) on May 25th 1963 in Addis Abeba, the ethiopian capital. The forming of a transnational organization like the OAU is considered as a important move towards political and economic unity. In 2002 the OAU led to the birth of the African Union (AU). The annual commemoration is used as a trigger date for pan-african celebrations in african expat communities throughout the world. 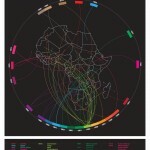 In the unique and elaborate design Colic’s Afrographique is famous for, his infographic “Africa Independet” shows the whole continent with its steps into indepence, starting with Liberia in 1847 stretching all over decades of history until the so far latest case of south sudan in 2011.